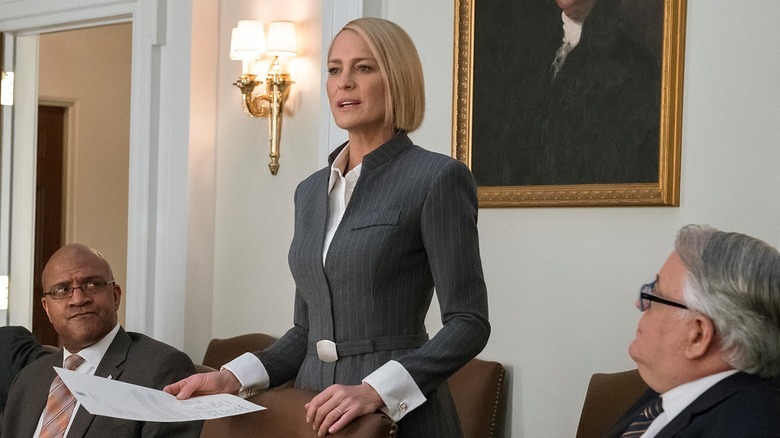 Robin Wright's President Claire Underwood will take her oath of office this fall. Netflix announced on Twitter on Tuesday that the sixth and final season of House of Cards will premiere on November 2 — four days ahead of the 2018 midterm elections. The streamer also released a sleek new poster for the upcoming season, showing Wright's Claire sitting stoic and stone-faced in a seat that resembles the one from the Lincoln Memorial in Washington, D.C. Her hand grips the end of the chair's right arm, blood dripping from her fingers and down the banner-decorated pillar. We suspect this bloodshed is a nod to what could potentially happen to Claire's husband (and now ex-commander in chief) Frank Underwood — played by Kevin Spacey — at the start of season 6, as well as a reference to the controversies that have surrounded Spacey in real life. Following reports that Spacey had sexual assaulted and harassed men who were underage at the time of the alleged incidents, Netflix fired Spacey from House of Cards. Director Ridley Scott also removed every trace of Spacey – who was also reported to have fostered a "toxic work environment" and exhibited "predatory" behavior on the Cards set — from his drama-thriller All the Money in the World. The filmmaker replaced Spacey with Christopher Plummer and reshot all scenes in which Spacey was featured. Amid the allegations, Variety claimed that House of Cards producers were looking to kill off Spacey's character and give Wright the opportunity to step up to the plate and carry the series. Of course, we know the latter actually ended up happening. But as for whether the series' writers and executive producers — including Wright herself — will give ol' Frankie Underprepared-to-Continue-Leading-the-Country the axe? That remains a mystery. When revealing the House of Cards season 6 poster and premiere date, Netflix added the hashtag "#MyTurn" to the announcement tweet. This seems to carry two meanings: 1) Claire now has the chance to seize power in the Oval Office and run the United States in the way she's always envisioned it would be run, and 2) it's 100-percent Wright's turn to top-line House of Cards. The actress has been a prominent force in the series' narrative since the beginning, and increasingly so since season 2, but it's high time Wright settles into the highest rank and lead the show through its final chapter. After Frank resigned as president at the end of season 5 and after Netflix booted Spacey from the show, plenty of people were left with blood on their hands — namely Wright's Claire. It's clear that in season 6, which will run for eight episodes rather than the usual 13, will see the new U.S. chief wash the red away and let freedom ring once more. Dive into House of Cards season 6 on November 2.